Regular readers of this blog, of whom there are a few, will remember that I once made a crack about the Scottish thinking Haggis is food. Well, I tried it the other day and must now reach deep down into my soul to find that last shred of integrity I’ve been hanging on to and make this admission: The Scots are right. Haggis is food and it is awesome. We’re currently staying with my cousin Fiona and her husband Richard at Park Farm, just outside an English village called Assington. Fiona’s parents came down from Scotland many years ago (before she was even born), and she is very proud of her Scottish roots. Hence her decision to serve us haggis on Sunday. This is the mythical haggis. Fiona has a great sense of humor and quite enjoys putting on a Scottish accent. She also really enjoys quoting Robbie Burns, and so our first taste of haggis was quite the occasion. 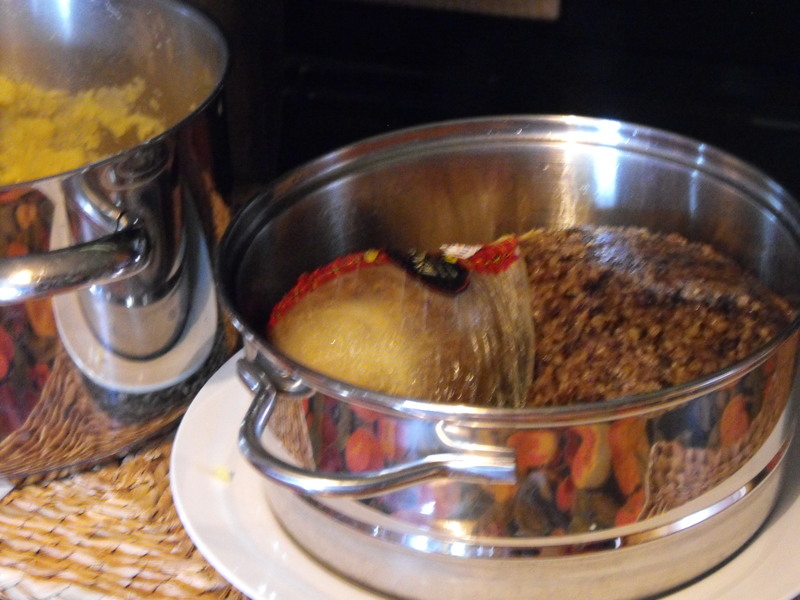 She read “Address to a Haggis” with extraordinary enthusiasm and made sure that she served this Scottish dish with the traditional trappings – tatties and neeps. In other words, mashed potatoes and mashed turnips. 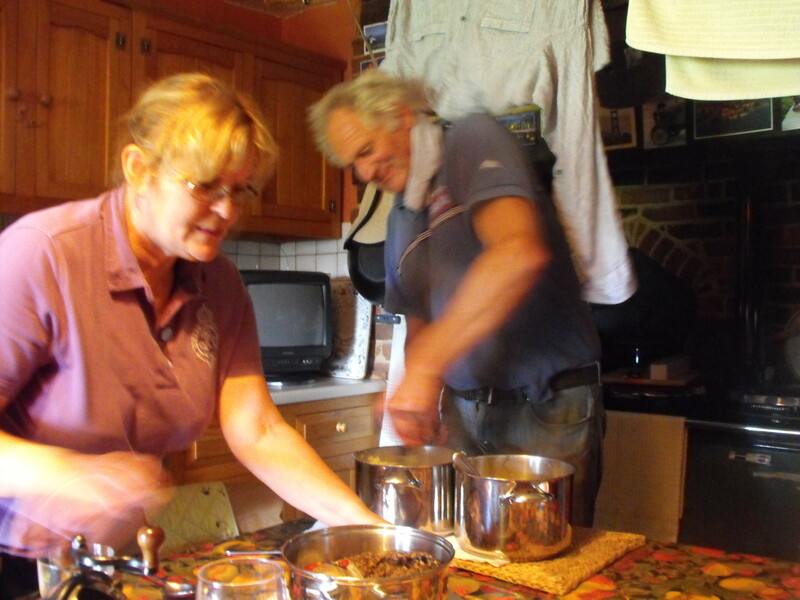 Fiona and Richard making final preparations for our meal. What I had heard of haggis before all this certainly didn’t make it sound too appetizing, but it was clear that sampling this little delicacy was not optional. Well, when the time came to dig in, I must say I was somewhat surprised. Haggis is damn tasty. It’s rich and spicy and I couldn’t get enough of it. Little Ian loved it, too. KJ didn’t like it quite as much as Ian and I did, but she had no trouble eating it. 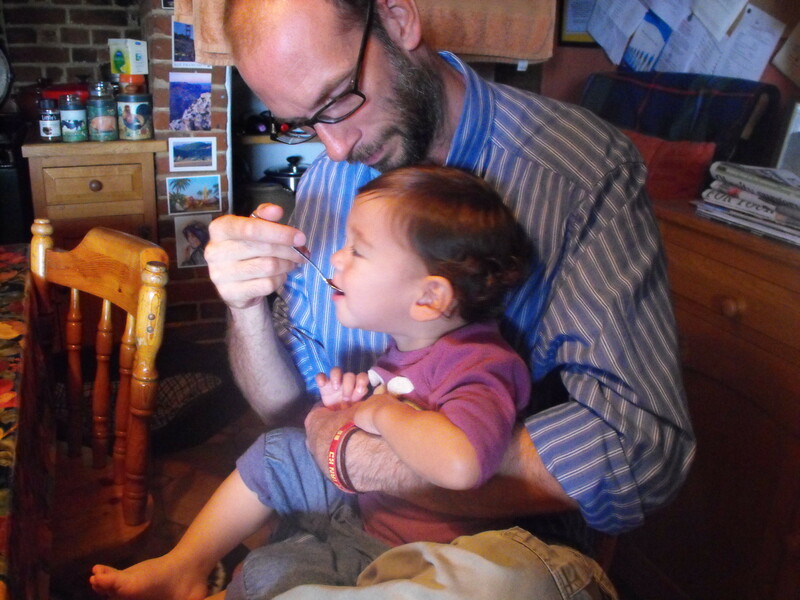 Ian's first bite of haggis. Our little guy isn't shy about letting us know what he thinks about the food we give him. If he hates it, he spits it out immediately. If he likes it, he grabs his little spoon and digs in. The kid dug haggis. We continued eating, but I became curious again. “So what are the other things that are in this?” I asked. KJ and I exchanged glances and then said no more as we continued eating. I had seconds and so did Ian. I must say I keep wondering what “other things” are in haggis. But out of respect for our hosts (and because it’s kind of fun not to know, actually), I haven’t looked it up. I’m sure whatever these mystery ingredients are, they are probably pretty gross. One thing I do know, though, is that once again, the Scots have gotten it right.